The ELF-2 submachine gun has been developed by one of the most controversial arms design facilities, the in-famous KB-ST (Design Bureau for Special Techniques) of Ukraine. This bureau actively worked during mid-to-late 1990s in attempts to produce new and perspective small arms of inexpensive price but theoretically outstanding combat characteristics (a concept recalling the so-called German "Wunderwaffe" of the last months of World War 2). Despite much hype and praise in local Ukrainian press no Russian or Western expert were ever allowed to test these "Wonderguns" seriously, and no production versions ever appeared. Taking into account the fact that KB-ST organization finally folded in about 2002, we may assume that these weapons were actually something else, representing a handful of roughly made prototypes of questionable usefulness. The ELF-2 submachine gun was intended to compete with designs like the Israeli UZI or the Austrian STEYR MPi-69/81. It had similar layout with magazine inserted into pistol grip and telescoped bolt. However, the bolt was made from two linked parts to provide slower (and more controllable) rate of fire of about 450 rounds per minute. Another very unusual feature was the forced air cooling system of the barrel - front part of the moving bolt acted like air pump, pushing the air through the barrel jacket. In theory, this was necessary to provide sustained fire capability, but the real usefulness of such feature in submachine gun is really questionable. Actual design of the two-part retarded blowback breechblock system was not disclosed, but this system was claimed to provide minimal recoil and vibrations. The ELF-2 fired from open bolt with advanced primer ignition. Other features included folding front grip (which also served as a spare magazine holder) and retractable buttstock made from wire and stamped steel. TECHNICAL SPECS: CALIBER: 9mm "Makarov" cartridges (.9x18mm-PM and .9x18mm-PMM "High Impulse) MAGAZINE CAPACITY: 25 or 35 rounds WEIGHT: 2,5 Kilograms unloaded TOTAL LENGHT: 41,6 Centimetres (Stock folded) / 58 Centimetres (Stock unfolded) BARREL LENGHT: 24 Centimetres RIFLING: 6 grooves, RH RATE OF FIRE: 450 Rounds Per Minute CLAIMED EFFECTIVE RANGE: 100-150 meters MANUFACTURER: KB-ST (Special Techniques Design Bureau) Ministry of Interior, Republic of Ukraine Now shut down. 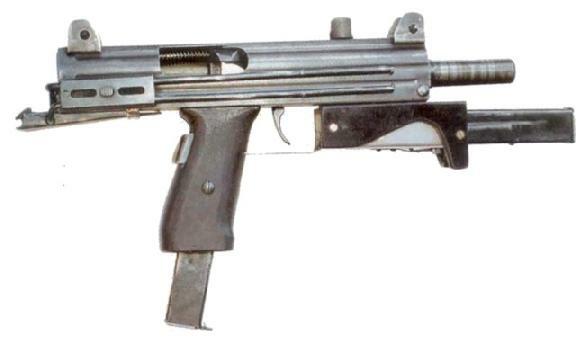 STATUS: Never passed prototype stage - project folded and later shifted in the 7ET9/7ET10 submachinegun (currently in advanced development stage by TASKO Corporation of Ukraine).